Don’t try to gild a lily. Don’t leave fish to find fish. And don’t try to re-design an iconic boat. Well, yes and no. Boston Whaler’s classic Montauk 17 center console skiff has set well-deserved standards for small-boat seaworthiness, durability, and utility for fifty-four of the company’s sixty years, but no one will tell you it’s perfect, including this writer, who has lived with a hard-working member of the breed for twenty-five seasons and counting. In the Chesapeake’s short, choppy seas, any boat of this length is going to have to move up and down a lot at any speed because it is too short to bridge the distance between wave crests. Trying to force the hull in these conditions will rattle everything in the boat, including her passengers. That said, there are many reasons why a well-designed skiff of this size makes sense. If balanced correctly, it’s just big enough to handle choppy Bay seas when operated prudently at speeds appropriate to the conditions. It is stable enough to allow skipper and passengers to stand and hold onto well-placed, sturdy rails, so they can handle the motion of running those seas by flexing their knees. It will run well and efficiently with moderate horsepower (60 to 115), even towing skiers and water toys when asked. It will tow easily on a single-axle trailer behind a mid-sized SUV or pickup and launch handily at all but the sketchiest ramps. Finally, this boat will float shallow enough to sneak over sand bars into the Chesapeake’s most interesting creeks and marshes. It’s hard to beat this class for versatility. 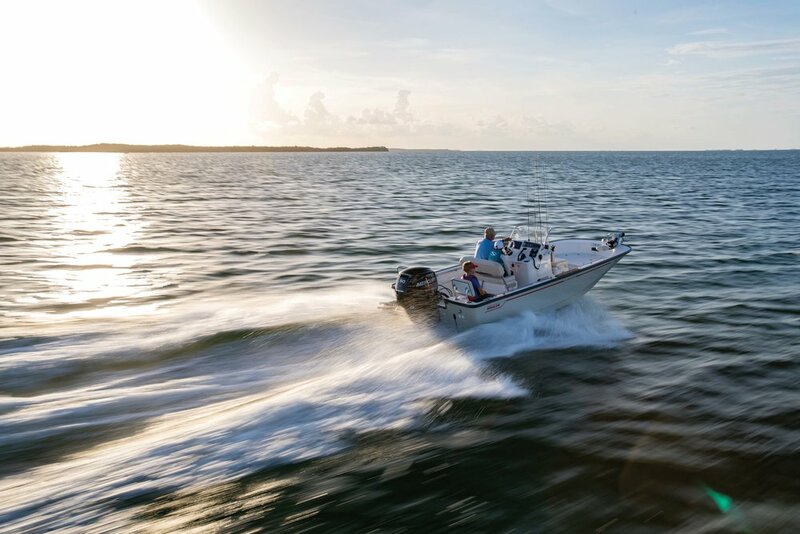 From the first center console model in 1964, Boston Whaler’s around-seventeen-feet center consoles have been overachievers—big little boats. Thousands of them are on the water around the world doing every sort of job imaginable. Whaler designers tweaked the hull shape in 1976 and enlarged the model slightly in 2003, but the new 2018 Montauk is a complete redesign incorporating important features asked for by customers and dealers while retaining most of the virtues of the original. We got to spend an hour with a standard model carrying a bow-mount electric trolling motor and a 90-hp Mercury at a Whaler press event in Sarasota, Florida in August, followed by a full day at the helm of an upscale model with teak trim and a 115-hp Merc during November’s Fish For a Cure Tournament around Annapolis. Based on these recent experiences, we can say that Whaler’s design team got this boat right. offers a skipper plenty of opportunity to find a comfortable speed in most conditions. Speeds with the 115 top out at 40 knots, but that capability is useful only on the calmest water. The two engines are based on the same powerhead, so the main reason to go with the larger engine is to support tow sports with a full load onboard. Other features added to this model include a 25-gallon aluminum fuel tank under the cockpit sole, the option of the bow-mount trolling motor with a second battery under the console, teak trim, a bow casting deck with fishbox, a dedicated anchor locker sized for a Fortress FX-7 with chain and rode, and optional cushions to form a sun pad. Our test boat included a sturdy Bimini top, which is easy to install and remove, a tow arch, a light blue hull, and a Raymarine Axiom 9 RV 9-inch electronics/navigation Package. Additional options include various seating accommodations, a cooler, and livewell packages. Test day at the Fish for a Cure Tournament. In two words, very well. The big 2.38:1 gearcase and 14.5-inch propeller provides plenty of shove, even with 900 pounds of people and gear aboard during the fishing tournament. Conditions were moderate, with northerly winds pushing one-foot seas, but we encountered plenty of powerboat wakes up to three feet high. The hull has 16 degrees of deadrise at the transom, flowing forward to 30 degrees at the bow entry, with a slight amount of rocker in the sharp keel to make the boat run slightly bow-proud. Though the hull is wider than its predecessor, the distance between the chines is less. The narrower footprint presents a more delicate balance between these bottom features. The result is a remarkably soft, dry ride at speeds in the twenties. It was almost impossible to make the hull pound or throw spray in the conditions we saw. Well, I did hit one wake wrong deliberately on the way home, and the boat came down hard on its port bow quarter with spray over the bow. That was my fault, not the Montauk’s. As with any new boat, it pays to spend time to learn to dial it in to a range of conditions. Your crew will appreciate the effort, and so will you. The bottom line? Boston Whaler isn’t resting on its laurels, or neglecting its smaller boats. The 2018 170 Montauk is an instant winner that stands true to its heritage as a safe, unsinkable little boat that loves the full range of Chesapeake-appropriate assignments. List prices range from $34,000 to $45,000 with trailer, depending on power and other options. John Page WIlliams is our fishing and boat review editor-at-large and the author of the Chesapeake Almanac column.